My children and I recently enjoyed a screening of the new movie, Walking With Dinosaurs by 20th Century Fox. 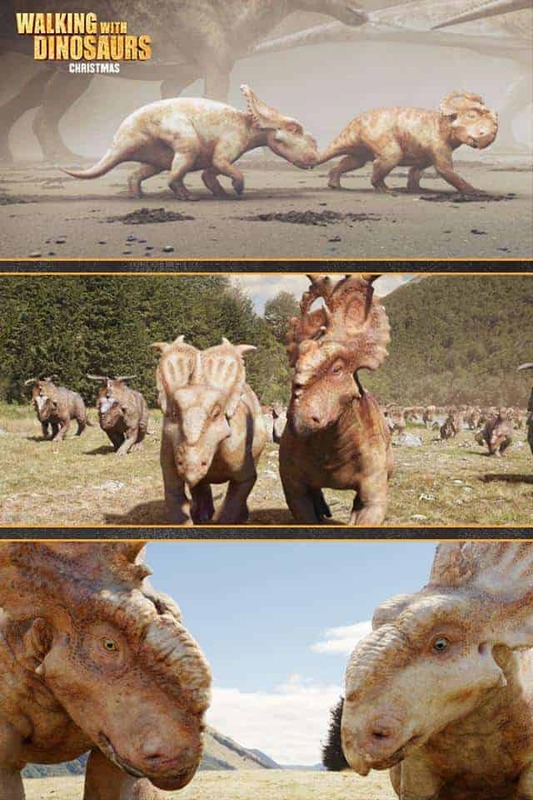 Walking With Dinosaurs 3D is smart, funny and visually stunning…..it is an exciting family film with heart! In this big screen adventure, my kids and I felt like we were transported back through time for a glimpse into the life of dinosaurs 70 million years ago. From the moment this film began, there was a hush throughout the theatre and it remained quiet despite the theatre being filled with kids of all ages. The children (and adults too) were captivated from start to finish and the only sounds that could be heard was laughter, gasps of amazement and spontaneous applause at the end. Based on the popular BBC series of the same name, Walking With Dinosaurs 3D is visually breath taking as it features glorious Alaskan and New Zealand backdrops along with realistic looking computer generated dinosaurs. Directed by Barry Cook and Neil Nightingale, the scenery and attention to details are stunning and I really appreciated the use of the natural environment. Creatively narrated by an Alexomis bird named Alex, this story features a young dinosaur named Patchi who is the runt of his litter. He looks up to his father who is the leader of the Pachyrhinosaurus herd and lives with his mother and his big brother, Scowler. He is also smitten by a sweet young female dinosaur named Juniper. As the herd sets out on their annual winter migration they face adversity and ultimately Patchi and Scowler find themselves alone. Patchi will battle the environment, other dinosaur species and even his own brother, Scowler. Will Patchi be able to prove to himself and the herd that courageous, brave leaders come in small packages (even those with a hole in the fringe on top of their head)? My children are ages 6, 7 and 8 and while there are realistic creature fight scenes with death in this PG rated movie there is no blood or overly scary scenes that frightened them at all. There are silly dinosaur poop jokes which elicited lots of giggles from the children and the comedic banter helped to lighten up some of the more realistic scenes. From a teacher standpoint-I appreciated that this film introduces each new species of dinosaur through a child narrator including both its Latin name with English translation. In my opinion, Walking With Dinosaurs attempts to inform the audience about dinosaurs while entertaining and while the story line and humor may make this different than the original series it still hit the mark in terms of inspiring my own children to want to learn more about dinosaurs. Long story short…..we loved it! Connect with Walking With Dinosaurs on Facebook and Twitter. I would love to see Walking With the Dinosaurs, I think it is great. I know the boys would also love it. Oh wow, I’d like to see this. Hearing there’s no blood or gore really helps and that the audience was captivated – it is hard to imagine these creatures roaming the earth, and this makes it real. I have to grab a few kids so I can gasp with them and applaud at the end!!! i would love to take my son to see this in 3D. he is so fascinated with dinosaurs and that they actually existed once. Wow that looks awesome.. 3D makes it so much more fun. Can’t wait to see this!! My nephew would love to see that. This is great for adults too. This looks so good! I have always loved dinosaurs! The whole family would like this movie, we like dinosaurs! I bet 3d really brings it to life. Love that it captivates kids and adults. I bought a video of the series for my grandson. I know this movie will thrill him. What a cute narrator! the boys LOVE dinosaurs. I love this is such a more realistic depiction of them! The special effects for that film is amazing. I can’t wait to see it! I want to take the kids to see this. It must be great with 3d! This looks fantastic! I can’t wait to take my little guys to see this! I have heard mixed reviews about this movie but I would still like to see it. It looks like a great movie for the entire family. We all want to see this movie! My daughter is super excited, I love the grahics. Want to bring my nephew to see this, he loves dinosaurs! This sounds to me like a really good film, I’d love to see it and I’ll bet my grandchildren would too. The graphics sound fantastic. Loved Your review Makes Me want to see it even more Cant wait to take My Grandson. He Loves Dinosaurs so it sounds like an excellent movie. My nephew would love this movie by the sounds of it. Love the graphics! I am amazed at the innovations in 3D animation. Sounds just up my street for some family fun and entertainment thanks for a great review Stacie! Hope all is good in NS I used to live in Bear River near Digby. Such a cute Movie!! for kids and adults alike! Sounds like an interesting movie. Thanks for the review. This sounds great. My fiance and I love the documentary series.My son is fascinated by dinosaurs and my brother really wants to see this! It looks like an excellent film! I loved Jurrasic Park. This movie sounds great. Cant wait to watch it. That sounds like a very good movie. I know my niece and grandchildren would love it. My grandson is into the dinosaur thing right now. never seen a 3d movie yet would love to experience this movie with my kids. I am for sure going to take my granddaughters to see this movie. I would love to take my grandson to see this movie and I think I would enjoy it as much as he would! This movie looks great. My son is obsessed with dinosaurs. Thanks for this review. oh! I didn’t even hear about this. now I want to see it, except 3d movies make me a bit motion sick. I’ll try some dramamine before I see it! My niece and nephew love dinosaurs and would surely love this!